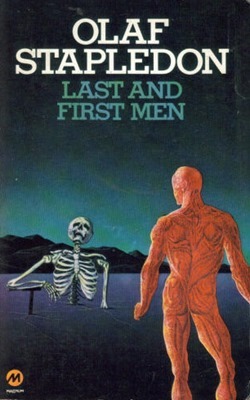 Last and First Men is probably the most unique sf novel I have ever read. Conceived as a future history of humanity the novel features almost no individual characters, no three act structure, and little dialogue. The basic concept is that a highly evolved human being 2 billion years in the future is sending a message back in time to us, the first humans in the 1920s (when the book was written). What he tells us is the history of our species for the next 2 billion years. In that time homo sapiens eventually go extinct but not before a new species of human evolves or is created. In all of the millions of years to come 18 distinct species carry on the human “career.” Some modern critics believe one should start with Chapter 4 and skip Stapleton’s speculation about the 20th and 21st centuries but I found those early chapters to be very interesting. As this was written before 1933 Stapleton would have had no idea about the rise of the Nazis in Germany. Therefore, he thought that it would be Italy who would start World War II. It’s an interesting historical artifact to read what an educated Brit thought the world was becoming before the actual WWII changed everything. Stapleton still got many things right. The world eventually moves towards a one-world-government, nuclear war is a real threat to all life on Earth, and humans of this age are too stupid and irresponsible to exist with such high technology. We destroy ourselves. Out of the ashes come two new species. One that is more intelligent and has larger a brain than us and one that reverts back to Neanderthal savagery. The Second Men eventually fight a brutal war with Mars. The Martians in this book are unlike any alien I have ever read about but they are clearly inspired by H.G. Well’s The War of the Worlds. They are in fact so alien that the humans don’t even realize that they are being attacked from another planet but believe it is some kind of Earth born plague at first. I can see why so many have lauded Stapleton’s vivid imagination. He seemed like an interesting man. He wrote books about philosophy before being inspired by Wells to write scientifiction (as it was then called). In the final summation it’s a unique work of imagination and speculation. It really gets the creative juices flowing and is not like anything else I have ever read. It can be challenging or even boring to read as the human race itself is the main character but I’m still glad to have read it. The influence of the book is obvious. Frank Herbert probably read it as the idea of ancestral memories brought out by the Water of Life is similar to a concept in this book. Also Herbert’s scope of time in the Dune series seems familiar to Stapleton’s idea of history repeating itself. There are so many concepts in this book that were never thought of previously. I disagree with many of Stapleton’s conjectures (such as religion still being a thing millions of years in the future) but his ideas are different and probably plausible. So it’s really a novel for the true science fiction fan who wants to read something different, something that is more famous for it’s influence, but I would call it a good experience in the end. Last and First Men is in the public domain.